Leftist activist who published a photo of orphan wrote: "Daddy went to a place where he can't burn fields." The complaint accuses the leftists of incitement to violence or terror, a punishable offense. 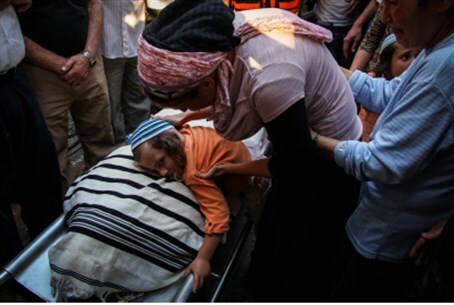 One leftist activist, Hila Shifman Galant, put up a link on her Facebook page to a photograph of Borovsky's son hugging his father's body at the funeral and wrote: "Daddy went to a place where he can't burn fields or poison sheep anymore. Don't take it so hard, sweetie." Shifman Galant has since apologized. She wrote: "I apologize for my harsh words yesterday, which were written in a moment of thoughtlessness. I understand that I turned my anger and despair to a direction that is the opposite of where they should be directed, and I hurt the family and people who are pained at the terrible murder that was committed. "What was written yesterday in a moment of despair does not properly reflect my true opinions about the complicated political situation in Israel. I apologize once again and I hope that in the future, I will know how to express my opinions in a more accurate and inoffensive way." Yossi Visoker, another leftist activist, wrote in his Facebook page: "So what… one piece of scum from Yitzhar (30 years old and already a father of five) was killed? What a waste. Stand in silence to honor his memory (hahaha, a victim of terror) next year. The people of Yitzhar are the real Amalek that must be erased from the face of the earth." Sagi Keisler, Director of the Samaria Residents' Council, said that this is not the first time that the Council filed a complaint against leftist incitement and slurs, and that he hopes the police will take more serious action this time. The incitement will eventually lead to physical attacks against the residents, he predicted. "The police should take the incitement seriously and take action against the inciters before they cause lives to be lost." Borovsky was a mild-mannered actor who appeared mostly in children's performances and therapeutic psychodrama, which incorporates role-playing and improvisation to overcome traumatic experiences. HIs oldest child is aged 7.